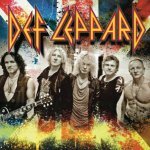 Def Leppard played a show in Quebec City, Canada on 13th July and the first fan review has been sent in by Steve. Steve has written a review of the show which took place at the Festival D'ete de Quebec. "Everybody was screaming their lungs out, which led Joe to this : "You'll probably think that I say this to every show we play, but this lineup has been together for 21 years, and this band for 35 years, and you guys are probably the best crowd we ever played for!." Read the full review via the show page.